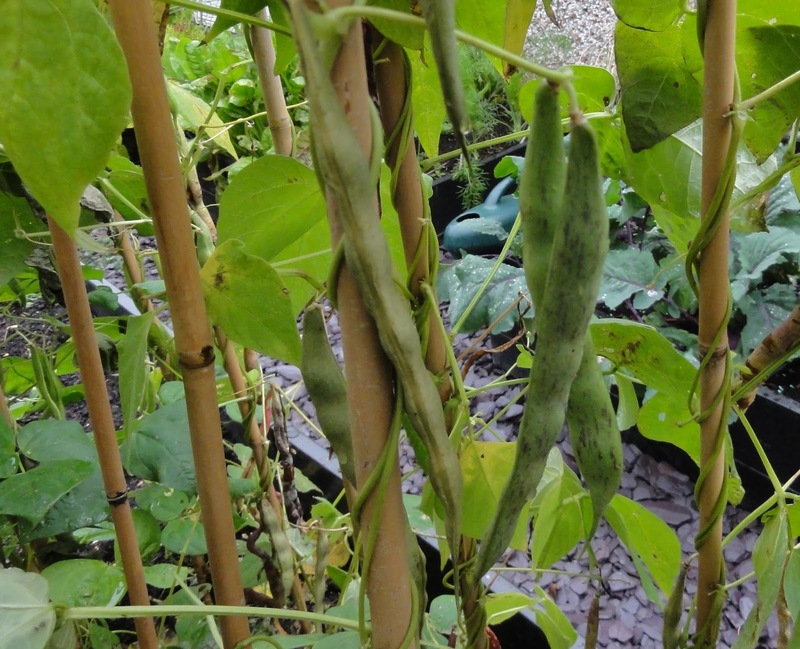 The growing season of 2014 has been one of the best years I've had for some time in growing climbing French beans. I've often done well with dwarf French beans and this year was no exception, but climbers have been more sporadic. However, this year, lots and lots of climbing French beans! Which is great, isn't it? Just splendid. I had lots of plans for those French beans. Many meals, including making 'frozen meals' for winter, to give me a burst of summer sun in the grey of winter. Sounds good. But when you are gardening with ME, harvesting and cooking is never that simple. Until about June, I hadn't done too badly with growing, harvesting and eating my crops this year. I had bad ME days that left me in bed, and plenty of days where I could only do one small gardening task over the space of a week. But until June I had managed my ME and energy levels reasonably well, and had got all the seeds I wanted into the ground and off to a good start. By late June the ME started getting bad again. A mix of travel and visits that were wonderful, but where I didn't manage my energy levels well enough and ended up with payback. That's the ME monster saying 'ha ha, just when you thought it was getting better'. The climbing French beans started cropping from late July, when I had another brief period of feeling a little better and I got my first couple of meals out of them. But things fell apart again in August and were no better at the start of September. Here I faced a dilemma. For much of September I would be travelling with my best friend Kerri, who was coming over from Australia for a few weeks. I needed, and wanted, energy to make the most of enjoying her visit. Something had to give. The climbing French Beans had to give. By early September, my energy levels were pretty low, and as wonderful as those beans were all looking, they had to stay on the plants, unpicked. I made the conscious decision to not pick them, because spending time with Kerri was more important. When you have ME, you have to make decisions like this pretty regularly. It's frustrating. But it is how it is. 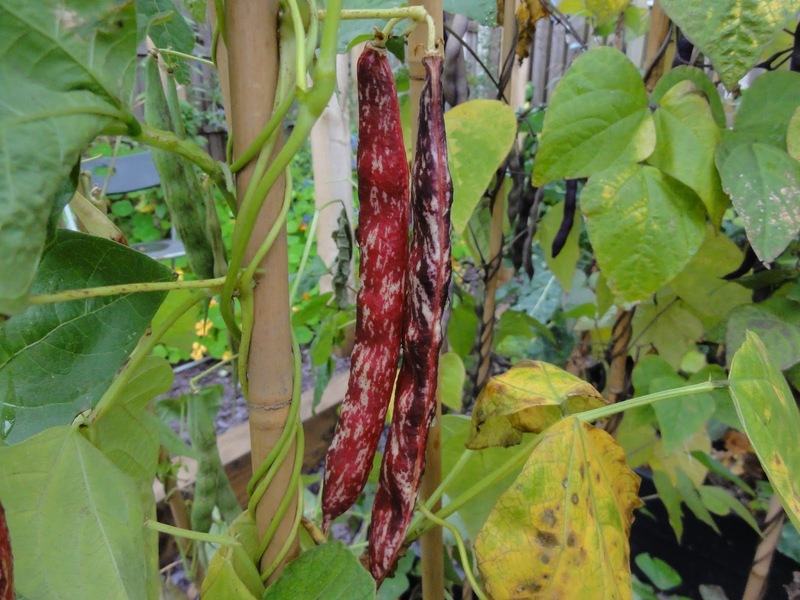 So the climbing French Beans, as you can see from the pictures, have gone to seed. But all is not lost. I couldn't eat the delicious young pods, but I can eat the seeds - yes! I can dry the beans out and they can then go into winter soups and stews. Happiness. I'm going to break the harvesting and collecting seed down into small tasks. Picking the beans over a couple of weeks, then drying them out. Once dry, I can start shelling them whilst sitting on the couch, a bit at a time over the space of days, even weeks. 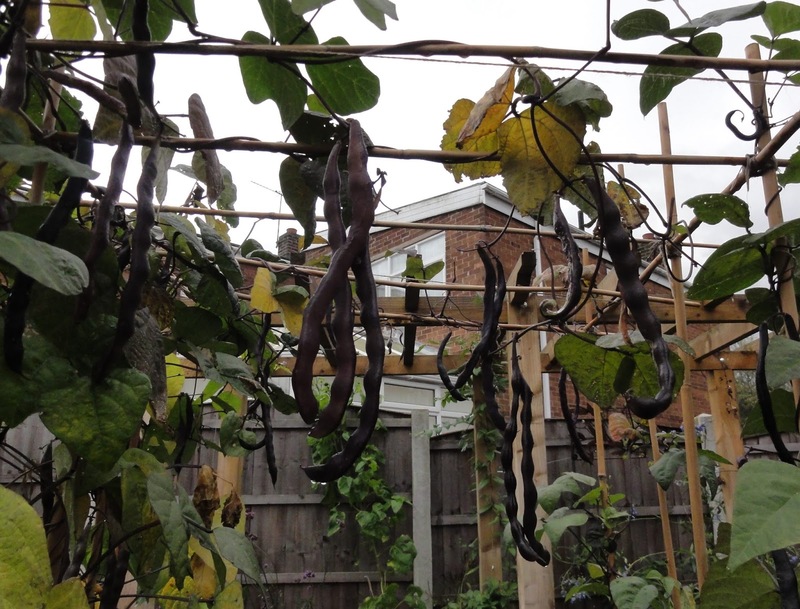 Thanks to ME, things haven't worked out on the climbing French bean front as I originally planned. But I will still get a burst of summer in my winter meals, only in a different form. That's rather splendid. These choices are never easy, are they! I've learnt to prioritise time with people too, having learnt that the garden is surprisingly resilient and forgiving. Glad you will have a use for your beans anyway, it can be hugely frustrating to miss out on eating things youvebgrown because you were too I'll to pick and cook them. It has happened to me too, and I'm sure it will again. There's a great lesson for everyone here - plant crops which have more than one way of giving just in case life conspires to change the course of best laid plans. Janet: the garden has done well without me the last couple of months; I've had good crops when I've been well enough to pick them. I'm sure I'll loose more in the future, but I get lots of joy out of the growing so I won't give up. Ingrid: I've always avoided runnerbeans as I don't like the pods, but then I think the only time I tried them they were incredibly stringy which put me off. I like the fact that the Czar are good for the beans inside so I will give them a go. I love Real Seeds, they seem to be very good at giving you seeds that do well in our temperate climate. Your comment about guilt is v. pertinent - I sometimes feel bad about 'wasting' food that I haven't been able to pic. That might be an idea for a blog in future. Mmmmm.